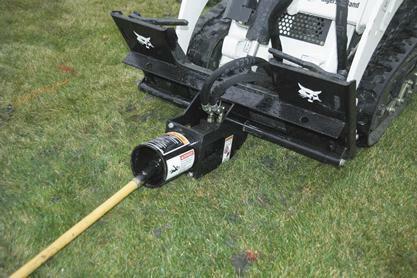 The boring unit attachment saves the time and expense of tearing up sidewalks, driveways and other paved areas. It’s an easy way to install underground cables and flexible pipes with little or no damage to existing roads, sidewalks or other existing structures. The hydraulically powered attachment bores horizontally to accommodate pipe or cable up to 4 in. in diameter. After boring, the attachment works to pull the pipe or cable through the hole. The boring unit frame allows the drive head to be mounted, from the front of the loader, in three positions: on the center, right or left side. This allows the attachment to be positioned directly next to obstacles, such as buildings, and be placed exactly where boring operation is desired. The loader’s auxiliary hydraulics power a motor that drives a screw-type boring bit through the ground as the machine is driven forward. The ground is compacted to create a tunnel under the driveway or sidewalk. When the bit reaches the other side, a reaming bit is installed. The loader is backed up and the rotating reaming bit further compacts the soil as it pulls the service through the enlarged tunnel. Boring Depth: Bores up to 2 feet deep and up to 30 feet horizontally. Manual Guide Rod: Starts the bit at the proper angle to ensure accurate drilling. Ideal for working in tight spaces. Three Positions: Drive head can be mounted in three positions: on the center, right or left side. Allows the attachment to be positioned directly next to obstacles and placed exactly where boring operation is desired. Versatility: Available with various sizes of bits, reamers and rock heads, allowing for maximum versatility and performance in a variety of environments.